This is our foremost offering for those who need a fast escape from the rigors of daily life in the city. The Middle Fork Snoqualmie River Whitewater Rafting trip is a classic Intermediate level Western Washington whitewater run and is the closest available whitewater to downtown Seattle. Our 1/2 day Snoqualmie River rafting trip features technical whitewater run with boulder gardens that weave through wild wooded scenic escapes while being only 30 miles from Seattle. Add the incredible scenery of the rivers upper section, as well as a catered lunch and you have an awesome day in nature. For those of you wanting a more intimate experience in the river, try an inflatable kayak trip on the rivers lower section. The Snoqualmie has something for all! Note: The Snoqualmie River rafting section which we utilize for whitewater is located above Snoqualmie falls on what we call the "middle middle", which is the center section of the middle fork of the river, located just outside of North Bend, Washington. Safety Protocol: Continuous whitewater safety protocol including safety kayakers if necessary (usually in high water or on smaller trips), trip leaders with advanced medical training on staff. Two craft minimum for each trip. Swiftwater rescue kits, medical trauma kits, emergency communication device. The Snoqualmie River originates from several high mountain lakes in the Cascade mountains to the West of Snoqualmie Pass. While being the closest whitewater run to Seattle, it also boasts some of the best wave running in the early summer. The Snoqualmie is a popular kayaking river almost year round, and is a treasure to those who spend time in its pristine, clear, natural, undammed river flows. This is a great river to get both a great whitewater ride as well as get out of the city for a great short adventure and be back in time for dinner. This river has many of the characteristics of one of our favorite whitewater runs in Washington State; the Sauk. With consistent and at times continuous class 3 "boogie water", the Snoqualmie keeps your heart pumping throughout the first 3 miles of winding river, as it explores an ancient river canyon and dramatic views of Western Washington forests. The "crux" of the run comes in a set of rapids known as "House Rocks", a legitimate Class 4 rapid at most flows, House Rocks requires precise maneuvering from the guide and strong and concise paddling from the crew. Only half an hour outside Seattle, the Snoqualmie River area is Central Cascades wilderness at its best. From sweeping mountaintop views to burbling waterfalls nestled in old growth forest, this area has something for everyone, from the dedicated peakbagger to the first-time hiker. It is well worth taking a day or a weekend after your rafting trip to explore. For those who want an easy meander through verdant old growth, the 2.6-mile round trip Twin Falls trail takes a scenic route along the river before heading up a short hill to the Lower and Upper Falls. For sweeping views of Mt. Si, Rattlesnake Lake and the Cedar River Watershed, Rattlesnake Ledge is a moderately difficult trail with a few switchbacks that take you up about 1000 feet in elevation over two miles. If you really want some elevation gain, Mt. Si has a bit of everything—old growth forest, alpine views, and 3000 feet of elevation gain in four miles. Those who reach the summit are rewarded with a panorama of forests and mountains, with Rainier rising above all on the horizon. If you’re looking to extend your trip to the wilderness, the North Bend area offers two great campgrounds. The Middle Fork Campground has 39 sites, toilets and drinking water. 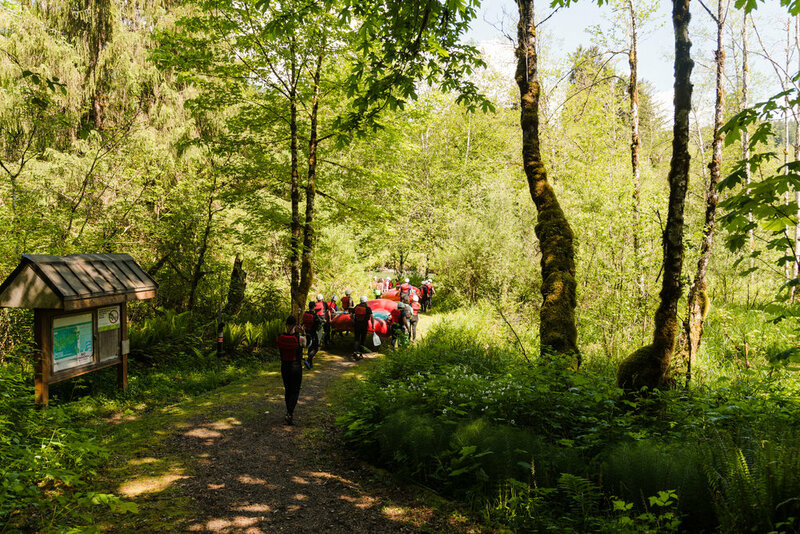 Set in a lovely stretch of forest along the middle fork of the Snoqualmie River, this campground is located near many of the area’s trailheads. The Denny Creek campground, one of the oldest in Mt. Baker-Snoqualmie National Forest, is within walking distance of three trails and has flush toilets. For those who want their flush toilets connected to a room, the Roaring River Bed and Breakfast just outside North Bend has great river views and hot breakfast delivered right to your door. If you aren’t getting food delivered right to your door, North Bend has a decent selection of restaurants. If all you need is caffeine, Pioneer Coffee Co is the place to stop. Il Paesano Ristorante is a fancier stop, owned by a local Italian family. If a classic burger and beer is more your style, try Brickyard Brewing North Bend Public House.